This was posted the other day but I can't find it now so please remove and give credit to OP if anyone else finds. 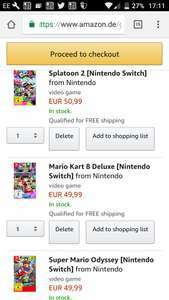 The German Amazon site has 3 for 2 on Switch Games currently. I managed to get Mario Odyssey, Mario Kart 8 and Splatoon 2 for £96 including delivery. All switch games are Region free so should work fine and these are all games that my daughter will want so no concerns about trade in value at CEX etc.that may be affected by German packaging? If you have trade in on your mind maybe avoid this deal. Apols to OP if your post still open. In OP other day there was also an 8 euro voucher you can claim but I couldn't figure it out even with the translate option. Still without the voucher £32 a game is a great saving on these premium titles at the minute. Forgot to mention discount is only applied at last screen of payment process just before you confirm payment at end (after selecting payment method). Sorry should have said discount is applied at end of payment process. You can go right through and check last screen before you confirm. Does this work with the downloadable games too? Is xenoblade 2 included in this? Yes as I said in my post but can't see it now think its been removed hence repost so others can benefit just worked for me. Not sure if you look on site and search it says 3 fur 2 under description on search screen. Yes as I said in my post but can't see it now think its been removed hence …Yes as I said in my post but can't see it now think its been removed hence repost so others can benefit just worked for me. Why are switch games so expensive? Tempted, but the german boxes/labels would irritate me, especially with their gigantic USK rating system labels. This expired yesterday - super cold. Deal posting newbie! This is Jasek999 first deal post. Help out by leaving a posting tip or just to show your appreciation for their contribution.